Screen printing, formally known as serigraphy, is a printmaking method that at the most basic level, involves pushing ink through a stencil onto a receptive surface, like fabric or paper. However, as with most printmaking processes, there are a lot of moving parts to achieve the perfect print! 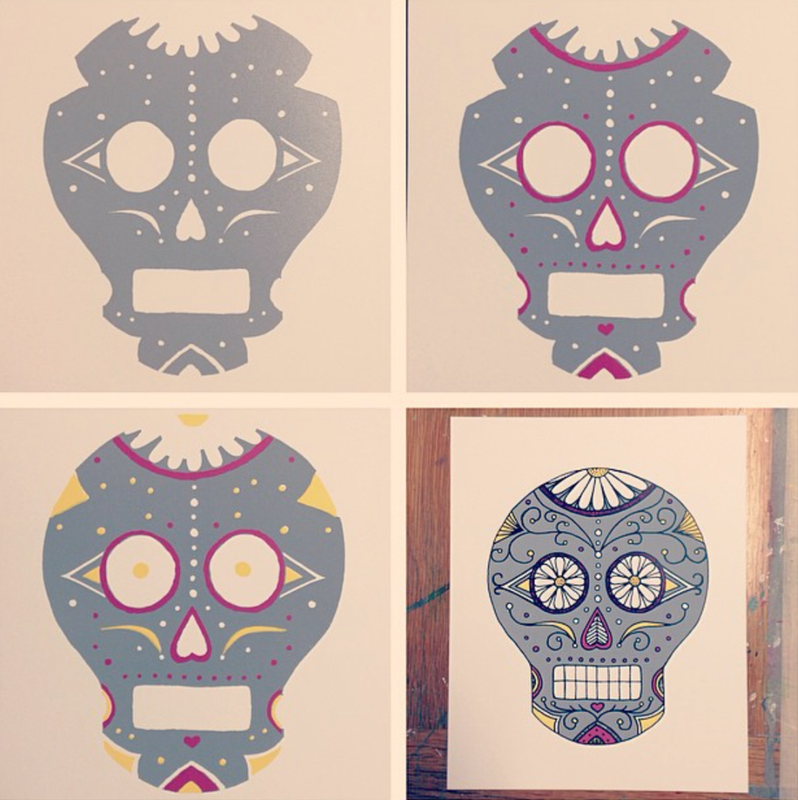 The following is a glimpse at what exactly goes into creating and printing exit343design wares. Keep in mind that there are all kinds of different ways to arrive at a screen print- this is just my own personal process. IT ALL STARTS WITH A PENCIL AND PAPER . . .
Just about every idea starts on paper, whether it's a brainstorm list, a simple layout sketch, or an actual illustration. I draw exclusively with the type of mechanical pencil in the photograph- a Papermate Sharpwriter #2. This started out in graduate school as a bizarre ode to my Grandma Harvey, but it turned into a genuine love for it. I also frequently draw on gridded paper because it helps me keep type straight and symmetrical.
. . . THEN IT'S ACETATE TIME! Once my idea or design is solidified, I need to make an acetate (some folks call this a transparency, a vellum, or a film positive) in order to make my screen using photo emulsion. If I'm using a physical drawing, I "ink it up" - basically make a cleaned up, final drawing in black ink on tracing paper. When I first started screen printing in college, I used to use the tracing paper as my final acetate; this involved many a paint marker and a lot of oddly-sized prints. Now, I scan all of my drawings in to my computer to clean up and resize. Once the image is ready, I print it out on specially formulated plastic that accepts inkjet ink. The goal here is to have a thick layer of inkjet ink so that light can't shine through. Also of note, in screen printing, each color is printed separately in layers. As such, each color in a graphic needs a different screen, thus a separate acetate. All of this prep work can be very time consuming, especially if your graphic has a lot of different colors in it! WHAT EXACTLY IS A SCREEN? The name silk screen is mildly deceiving- screen or “mesh” is most commonly made out of a finely woven nylon. The fineness of your mesh determines the resolution of your print. The lower the mesh count number, the fewer holes and the more ink passes through for less detail (lower meshes are good for printing on tshirts and fabric). The higher the mesh count number, the more holes which allows for precise and fine imagery (ideal for posters and paper). No matter the mesh count, said mesh is then stretched very tightly onto a frame made of either aluminum or wood. COOL, SO HOW DOES THE IMAGE GET ON THE SCREEN? First, I coat my screen with photo emulsion. This is a thick, light-sensitive and water soluble liquid that I apply in a fine filmy layer onto my screen mesh using what's called a scoop coater. After application, it needs to dry in a dark spot for about an hour. Once it's dry, I'm ready to "expose my screen." I lay my screen down and put the printed acetate face down on the dry emulsion. Then, I lay heavy glass on top of both to keep the image flat and taut against the screen. When that's ready, I turn on timed lights above the glass. Remember when I said the acetate image needed to be opaque? This is why- the light hardens any emulsion it comes in to contact with. Any emulsion under the black ink parts will wash out with water. If you're having a hard time visualizing what I'm talking about, here's a random photo from the Interwebs that may help. After exposing the sensitized screen to light, I wash out the un-hardened parts with water in my slop sink. Once complete, this leaves a stencil on the screen, just like in the photo above- the pink part is hardened emulsion, the white is clean mesh. Now I have a screen made for each separate color in my design. The above image is an actual shot of where and how the printing happens! Those knobs on the left are hinges; they're screwed in to my table and they're how I keep my screen in place when printing. I use a combo of a clear acetate and tape to make sure my prints are registered, or lined up properly. When everything is lined up, printing can commence. I place ink above what I'm printing on the screen and pull the squeegee towards my body to drag the ink over the stencil area. I apply pressure when pulling the squeegee and this pushes the ink through the mesh onto the paper or fabric. And there you have it- a print! This is me making sure things my paper is registered, or lined up, before printing. Another angle of printing; I often put multiple graphics on one screen to maximize space. This composite shows how each color is printed separately. Every ink color has to be registered separately and uses a different screen/stencil. Screen printing involves a lot of time waiting for things to dry!